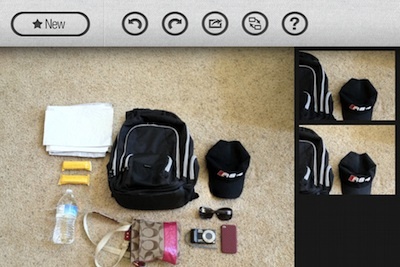 Merging the best parts of multiple photos into one on the iPhone – Free app till March 11th! At first when I saw this app, I thought about the number of times I take group shots of people. It is a pretty low number so I didn’t see the need to load it on my iPhone. Last weekend I was taking a photo for a collector’s site about the things to carry when walking big outdoor shows. When I went to use one of the photos later, I found that the strap of the backpack was showing in one photos where everything else was perfect. Another photo the backpack was better but there was glare on a couple of the object. Normally, I would set out to handle the glare. Instead, this time I went looking for that Group Shot app I had seen earlier. With an option like GroupShot, it does remind us though that taking an extra shot or two is pretty good idea. If I had been taking photos of groups of people, I could use GroupShot to find the best parts of all of the shots and merge into one! Having seen that the app GroupShot is FREE till March 11th, it might be an item to add to your iPhone camera bag now to have when you need it later! Back to the collector’s bag shoot. 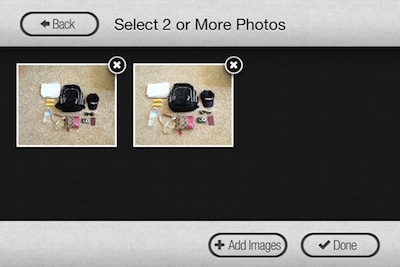 GroupShot can be used to take pictures or you can import shots in from your iPhone’s photo library. Choose which photo will be the core photo to have other ‘better’ parts added too. GroupShot supports two finger zoom in/out so you can do better precision work. Highlight the part of the photo you want replaced. Now choose which of the photos you imported has the part you want. 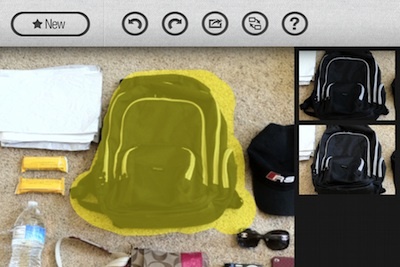 GroupShot automatically replaces the highlighted part of the photo with the same area from the chosen photo. You can repeat if you have other parts of the photo to replace – like a group photo of five people could be the best faces from all the photos taken into one final photo. The finished photo can now be saved to the camera roll, attached to an email or shared on Facebook/Twitter. One item to note about Group Shot is that the end photo is 800 x 600, so great for sharing online and posting to a Web site, but a bit small for printing. Works pretty well, and the ‘free’ through this weekend isn’t bad either!